If unanimous testimony and lap times aren't enough...then yeah. I guess facts are good too. At the same time ,if all we had were facts and charts then everyone would be like, "yeah, but I want to hear from people with real-world experience". So ,either way ,I guess..? Last edited by MinusPrevious; Jan 9, 2019 at 06:54 AM. I found found my self in the same position regarding the same decision. I also feel after quite a bit of reading on the topic that an often overlooked coil over in this category is the HKS Hipermax. The HKS comes in two varieties as well (gt/sp) and the fronts are inverted like the ohlins. If shopping around both varieties of HKS can be had for under 1,500 shipped. Lap times are certainly a metric but one that relies on way to many factors here. I would even argue, somewhere around 98-99% of the performance on a perfect road course lap time could be done with complete **** shocks setup well and driven around any odd flaws like complete f/r miss-match damping ratios. Reason I say this, you spend most of your time on track in steady state and a perfect lap wouldn't need significant midcorner adjustments or controlling out of ordinary behavior like hitting a curb too hard, dodging another car, etc. The shock isnt going to change your maximum lateral grip, and in transition even a crap shock is going to provide some amount of damping. It might be way to little or too much, too harsh or too slow. But these are things drivers just figure out how to drive around. To me, a lot of the magic of a good shock is being able to control the wheels or rate of roll in a way that's more unobtrusive. I don't want the shock to make the car feel artificially stiffer like the Evo oem shocks did (not the bilsteins, the GSR shocks) or the current FocusRS shocks. Or wallow around like a chevy SUV that seems to respond to a bump for days after its hit it. This is going to help in areas of heavy transition (AX, rally, etc), immediate need (like dodging something), or ride comfort. The DFV is a great balance here on the variable even if its not perfect for top level racing. It might just be a happy accident that even though they have the spring balance wrong, the valving balance between compression and rebound in their dual adjusters are suited well to the Evo's distribution of weight and motion ratio. The dropping of compression seems to work well with the rebound as things are adjusted to make it comfortable on the street and adequately controlled on the track. You will still get to a point where more rebound or less compression is needed but you cant add one without the other. At that point you really need a fixed compression for the spring rate or double adjustable. I would certainly put money on a custom set of Stance or FA or whoever over DFV when it comes to high spring rate setups. But they arent going to also likely be street friendly. If I were to put my money where my mouth is, 100% DFV on any car that sees >50% street use. 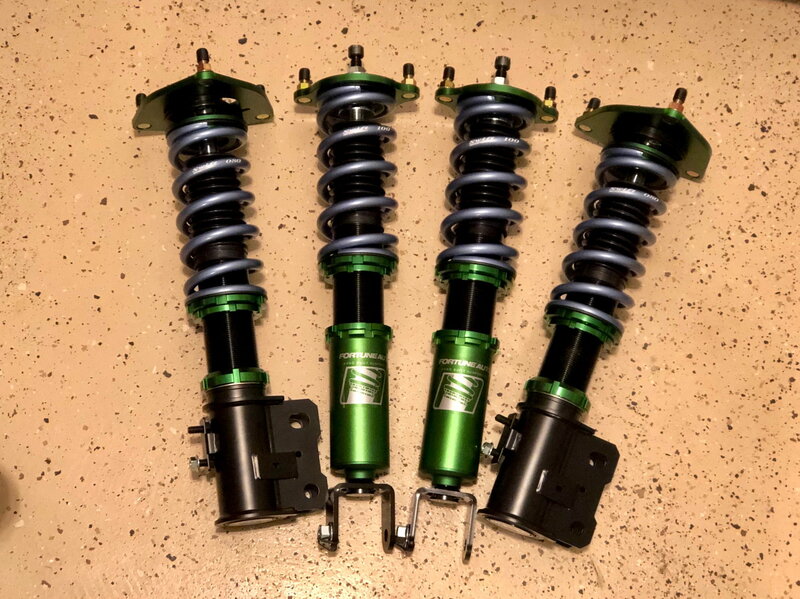 Once you hit mostly track, I would be more critical on the guy building my shocks, their experiences and wins, and what he can recommend. Right now I think the guy I would call would be Guy Ankeny. Just so those that maybe interested in FA C/O'r, their valving has a name as well (Ultra Digressive Piston). In laymans terms, the valve blows-off during hard hits (potholes, track curbs etc) & then returns to normal valving. Last edited by MinusPrevious; Jan 9, 2019 at 09:40 AM. Also want to add that the money savings you would get with the HKS/FA could be put to use in areas that will matter as much to your overall performance and experience. Coilovers are not the end all solution. Once you make up your mind on a certain product, you will need to invest in ( setup, alignment, tires, bushings ) etc. This will maximize your experience. I know because I've had to do this already. Since doing the install of my FA's I think I've had 4-6 custom alignments, $$$ could have spent that on another set of tires. When I got my FA's I slapped them on the Evo not knowing anything about setup and didn't pay much attention to what was required to get the most out of the product. I hated the car as it would not do what I needed it to do. I was fighting it in autocross, I was slower than I was with my stock shocks with Hotchkis lower springs. I went backwards to go forwards. I thought I had made a big mistake but it was all my fault, I had no clue on setup and or how to use the coilovers. I remember once I installed them, like a rookie I cranked everything to full stiff. I was a fool, over the course of trying new ride heights along with backing off from full stiff to where I am now. I'm close to full soft. I love how my car feels now and I have room to go to get the most out of my setup. We have an upcoming autocorss and I'm considering raising my front ride height half inch as I need to rotate the tires to get more out of my setup. I was just too lazy to type all that Anyone else have issues typing on the phone app? Like every other word is autocorrected wrong and the spelling gets all whacked when you try to correct it. LOL. And I forgot to say "thank you". Details on Guy Ankeny? He's been in the game a long time building custom shock setups. As long at the they are within 2k of each other (I assume valving can handle +/-2k), should be fine, I'd think. Hopefully someone who knows for sure can chime in. 26mm is a lot of bar for only 10k rear. That ends up being almost 60% of your total roll rate in the rear is from the bar alone. I'll caveat that with, from the factory the front is 50% and the rear is 60%, but those are also much lower rates and these car are pretty heavily dampened low speed from the factory. I would be looking to run something in the 22-24mm on the 10k rear springs. I run the same bar, but double the spring rate. I'm running 10k rear with a 25 mm bar on second from soft. Feels pretty decent. Hmm.. I had initially planned on just getting a 24-25mm bar and this past Christmas the wife gave me the whiteline 26mm RSB, I wasn't about to tell her she bought me the wrong parts! So that's how I ended up with the BIG bar! Do you think running the Ohlins at 8k Front 10k Rear Will be okay?